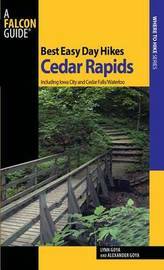 Best Easy Day Hikes Cedar Rapids includes concise descriptions of the best short hikes in the area, with detailed maps of the routes. The 19 hikes in this guide are generally short, easy to follow, and guaranteed to please. Lynn Goya is the author of Fun with the Family Las Vegas (GPP Travel). She revels in exploring Iowa's burgeoning trail system with her son, Alexander Goya, a backpacker, rock climber, and adventurer.